Many would say there is clash between Caraqueños – Venezuelans born in Caracas – and Maracuchos or Marabinos –Venezuelans born in Maracaibo; e.g. Pablo Pérez and Juan Cristóbal Nagel. But I could only speak from the Caraqueño side of the quarrel. Until now that is. My flight was set to leave for 7am. We took off at 7:43am. Not bad. Maracuchos have a very distinct way of talking. The Maracucho accent was my first real taste of Maracaibo. It’s rather difficult to explain, so here is a taste of it. “A la verga” & “Vergación” & “¡Qué molleja!” = Wow!. “Cepillao” = Flavored shaved ice. “Chinita” = Virgin of Chiquinquirá. For some other common Maracucho expressions, here is a dictionary I found online. The food is simply AWESOME. 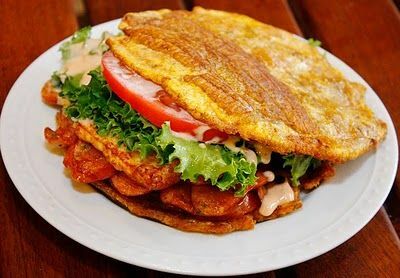 “Patacón”: a sandwich of sorts, that’s served with fried plantain slices instead of bread. Zulia and its capital city, Maracaibo, are synonymous with “Gaita”, a musical genre typical during Christmas Holidays. But Maracaibo is also synonymous with GREAT –and fattening- food. There is a myth among Caraqueños that Maracuchos eat all their foods with mayonnaise or salsa rosada –a mix of mayonnaise and ketchup. Not true. But they do eat tequeños – heavenly piece of fried dough filled with cheese – with ketchup or tartar sauce. When my colleagues heard I was going to visit Maracaibo, the first thing that came out of their mouth was: “you must eat…” yoyos, tequeyoyos, tumbaranchos, agüita de sapo, macarronada, patacones, mandocas… and the list goes on and on. But on this “Ana vs Food” two-day challenge, I failed horrendously. Of the traditional Maracucho cuisine, I only tasted torta de plátano – plantain cake, a lasagna-like dish made with plantain bananas, eggs, and typical maracucho white cheese -, bollos pelones –small corn flour balls stuffed with ground meat and bathed in tomato sauce – and cuajada –curd. This and everything else was simply DELICIOUS. I also brought home some huevos chimbos -sweets made with egg yolks, cognac and syrup-, dulce de hicaco –coco-plum sweets-, and conservitas –native fruit roll-ups. I have a long list of foods left to taste. I’ll hopefully blog about them when I get to it. TIP: if you live in Caracas, there is a small food place on the bottom of la subida de Los Naranjos called “El Toque Zuliano” (@eltoquezuliano). I’ve tasted the patacones and the tequeños there, and they are heavenly. Let’s talk about the heat. Maracaibo is a REALLY hot city. I’ll admit I was rather scared. However, you tend to be in and out of air-conditioned spaces, so it is tolerable. I would even carry a sweater with me. El Puente … clouded my mind. There is a Gaita that goes: “cuando voy a Maracaibo, y empiezo a pasar el puente, siento una emoción tan grande, que se me nubla la mente”. 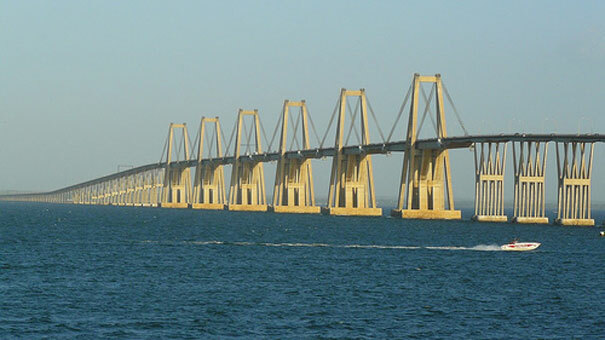 -When I go to Maracaibo and I start crossing the bridge, I feel a great emotion that clouds my mind. That “bridge” is the General Rafael Urdaneta Bridge, or the Bridge over Maracaibo Lake. I must say: I was speechless. I knew it was big. But it’s bigger than I had imagined. The bridge is over 8,678 meters long, almost 7 times as long as the Golden Gate Bridge in San Francisco. It also has a height of 86.6 meters, only 16.4 meters less than Torres del Silencio in Caracas. Sadly enough, I was told that the 21st pillar was a common place to “end your problems”. Maracaibo has its own Plaza Francia. Plaza Francia in Altamira is a meeting space for the opposition in Caracas. Its iconic obelisk was the backdrop for many opposition rallies, as well as the horrible shooting of December 6th, 2002. It turns out that Maracaibo has its own obelisk and opposition meeting spot in Plaza de La República. I was told that it was an important rally spot during the 2014 guarimbas. 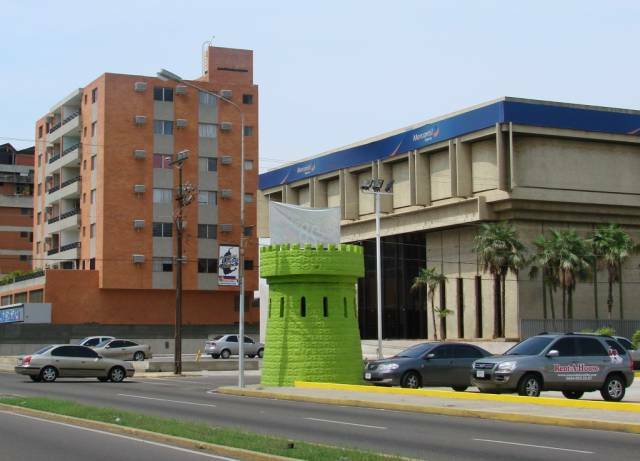 Did you know there used to be a castle in the middle of Maracaibo? A green tower, one of the only ones left of what used to be the Castillo de Lucas Rincón. If you drive past Av. Bella Vista, between 73rd and 74th street, you might see that there are a couple of green castle towers at each end of Diverzone –an entertainment center. It turns out those towers were part of an actual castle, the Castillo de Lucas Rincón, built in the early 30s’, over an area of ​​6,700 M2. The structure had a watchtower at each of its four corners and was surrounded by four meter high walls made with decorative bricks. Workers tending the courtyards used to sleep in the towers. In the 50s’, Don Lucas Rincón visited Europe and bought the title of “Count.” His coat of arms lay over the main entrance. During his European trip, Rincón used a “Black Presidential Cadillac”, which he then brought to Maracaibo and used for many years. Don Lucas Rincón died in 1969 at age 73. The castle was demolished in the mid-90s’ fearing that it might be declared heritage of the city and the heirs would lose their property. “Bachaqueo” was born and raised in Maracaibo. As soon as I left La Chinita International Airport on my way to the hotel, reality set in: there was a 20 car long line at La Chinita Service Station. The taxi driver said it was rather short. After gasoline smuggling became a common reality in this border state, the bachaqueo was implemented for the first time in a supermarket in the northern part of Maracaibo. Specifically, the current Bicentenario Supermarket located in Fuerzas Armadas Avenue, only 300 meters away from a National Guard post, or so the legend goes. The bachaqueo (buying in order to sell in the black market, or in neighboring Colombia) was born when fixed prices offered an easy gain in the resale of regulated products across the border. Nowadays, bachaqueo is synonymous with black markets, and almost everyone knows at least one bachaquero that can get you one of the infinite products that are almost impossible to find in regular stores, pharmacies or supermarkets. Las colas are just as common in Maracaibo as in Caracas, but they began in Maracaibo way before. And, just like in Caracas, those big lines are a sign of scarcity, bachaqueo and –of course- rationing. I was shocked to know that school supplies are also being rationed. I visited a rather big bookstore. A lady asked me to buy 3 notebooks for her. She and her husband could only buy 3 each and they wanted to get a head start on next year’s school supplies list, to try to avoid the inflation wave –or tsunami. The icing on the cake: the cashier said I’d have to give the lady the notebooks outside the store. I felt like a criminal. Crime: a common trait in all Venezuelan states. The taxi driver that drove me from the airport to the hotel told me that he was robbed a couple of days before. The malandros took his Kia van and some cash, but he was able to get it back using a GPS system. Sadly enough, this would be the first of many crime anecdotes. I heard a couple of stories of mass robberies in supermarkets and annoying purse lifters. We’d walk quickly to get in the car because the “area wasn’t safe”. I’d hear a worried mother asking her son not to go to the movies at night. I was told how policemen tried to matraquear –illegal fine charged by policemen- a car driver, but desisted when they noticed that he was accompanied by his grow-up son. Just like Caracas, Maracaibo is infested with crime issues. Maracaibo was and wasn’t all I expected. Maracuchos are truly welcoming. Their food is awesome. Their accent was more than palpable. But the thing I liked the most: how they, in the mist of the crisis, are more than proud of their city. Previous articleHyperinflation or just high inflation?